Antonin Gregory Scalia (March 11, 1936 – February 13, 2016) was a Conservative jurist on the Supreme Court of the United States. He was an Associate Justice. Scalia was put on the Court in 1986 by Ronald Reagan and was the longest-serving justice on the Court. Before becoming a justice, he was on the District of Columbia Court of Appeals and was a law professor. He was a Roman Catholic born to Italian American parents. He was the first Italian-American on the Court. Scalia was born in Trenton, New Jersey, but grew up in Queens, New York. Scalia went to Georgetown University, the University of Fribourg, Switzerland, and Harvard Law School. He began his career in Cleveland, Ohio and traveled to Chicago, Illinois during his early life. Scalia was noted for holding a conservative approach to the law. He also believed in originalism. This means he wanted the Constitution interpreted exactly as its framers had wanted it. Scalia and fellow judge Clarence Thomas often had the same viewpoints. He was friends with justice Ruth Bader Ginsburg. Scalia died in his sleep on February 13, 2016 at a ranch in Shafter, Texas at the age of 79. His death left a split in the court with 4 conservatives and 4 liberals. President Barack Obama said he would choose Scalia's successor in "due time". President Obama, former Governor of Texas Rick Perry, Governor of Ohio John Kasich, former Presidents George H. W. Bush, Bill Clinton and George W. Bush, Senators Ted Cruz, Marco Rubio, and Bernie Sanders, and Vice president Joe Biden all reacted to his death. On March 16, 2016, President Obama nominated Merrick Garland to replace Scalia. After Republicans refused to give Garland a confirmation hearing, his nomination expired in January 2017. On January 31, 2017, President Donald Trump nominated Judge Neil Gorsuch to replace Scalia. Gorsuch was sworn into office on Monday, April 10, 2017, in two ceremonies. In November 2018, Scalia received a posthumous Presidential Medal of Freedom from President Donald Trump. ↑ 1.0 1.1 Barnes, Robert. "Supreme Court Justice Antonin Scalia dies at 79". Retrieved 13 February 2016. ↑ "Biographies of Current Justices of the Supreme Court". Supreme Court of the United States. United States Government. February 9, 2016. Retrieved February 13, 2016. ↑ "Obama Chooses Merrick Garland For Supreme Court". The New York Times.com. Retrieved March 17, 2016. ↑ "President Donald J. Trump nominated Judge Neil Gorsuch to the United States Supreme Court". Office of the White House Press Secretary. January 31, 2017. 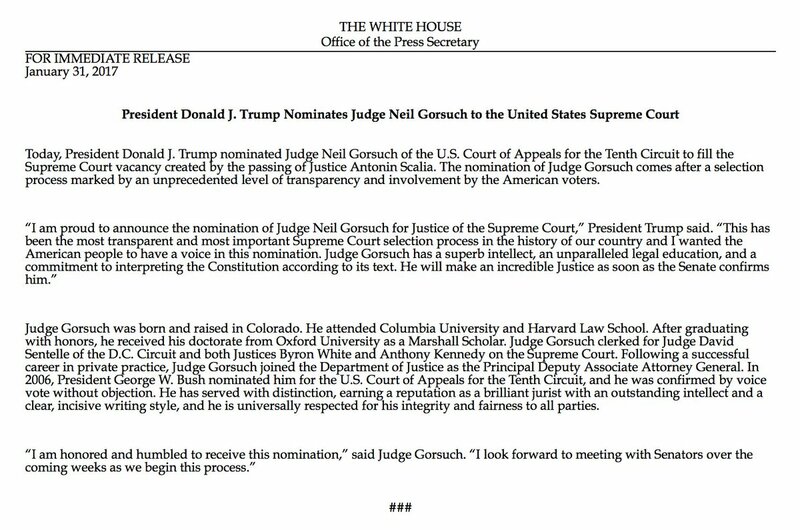 ↑ "President Donald J. Trump Congratulates Judge Neil M. Gorsuch on his Historic Confirmation". April 7, 2017. Wikimedia Commons has media related to Antonin Scalia. This page was last changed on 12 November 2018, at 07:06.